last sunday's bike ride was a decidedly pleasant affair, complemented not only by the relatively warm and sunny weather, but by the surprising number of local velocipedinists that arrived to make up the morning's peloton. as we have seriously neglected the col de storakaig of late, it seemed the only proper thing to do was plan our perambulations to include this 8% but fairly short ascent. however, for all that it lacks in climbing duress, it makes up for with a road surface that would put paris-roubaix to shame and an itinerant frame of cattle. in a situation that is not oft repeated, we benefited from a tailwind going up, and into the returning headwind, the gentle slope from ballygrant to bridgend was attacked with alacrity and not just a little puffing and panting. though the sunday morning route takes a variety of forms, depending on numbers, fitness and weather, all roads lead back to debbie's. that latter fact is the carrot at the end of the stick. no matter the strength of the wind or the density of the precipitation, it's undoubtedly worth ploughing through, simply for the fresh aroma of coffee that can be appreciated as far away as crosshouses. this is not the metropolis; even when the island is busy, as it was this past jazz festival weekend, it's still a darned sight quieter than many an urban conurbation. therefore when the velo club eventually arrives at debbie's café we plop ourselves down across several tables (avoiding the leather couch; we'd never arise from the comfort of that) and wait 'till coffee is served. the manifest problem that was all too obvious this past weekend, was the rather large number of road bikes already scattered midst the picnic tables on the patio. as expected, these bicycles had owners, gents who were occupying every available seating space inside and still midway through their coffees and cake. we, however, occupied the moral high ground and sat outside. i have petitioned brian cookson at the uci and fully expect sanctions to be levied. i'm beginning to see graeme obree's point about how he preferred things when cycling was a minority activity and to be seen speeding about in sportwool and lycra was something upon which the civilian population was pretty much honour bound to comment upon. and not always favourably. now, it seems, we are in danger of being squeezed out of our ancestral home by pelotons of usurpers, a situation that now requires an upgrading of the secret handshake. as discussed previously in these very pixels, this has, until now, consisted of identifying those little oval tanned areas on the back of the hands, the very region left open to the elements by a pair of proper cycling mitts. alternatively, but far more dependent on curcumstances is observation of clean cut tan lines, something far less prevalent north of the border and all but non-existent in the hebrides. but if everyone and his/her best friend is going to arrive with pelotonic support, separating the cognoscenti from the great unwashed is going to be a lot harder. 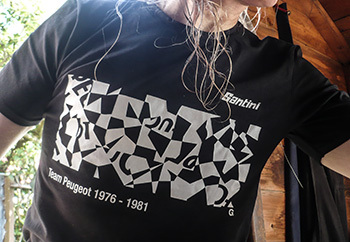 and that's precisely where the latest t-shirts offered by prendas and santini come into play. 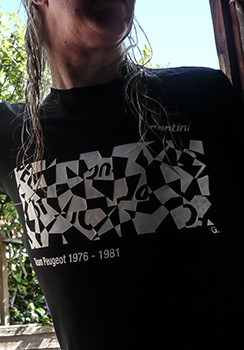 while ostensibly simply dressing in a regular if slightly relaxed manner, the mashup design on the front (in this case, based on the classic and iconic peugeot chequerboard design) is something of a gamechanger. any dyed in the wool cyclist will immediately recognise the connection; a hod's as good as a sink to a blind norse, if you see what i mean? those in the know will already be clicking the prendas order button, having chosen from peugeot, mapei, mercatone uno or maglia rosa. and if we don't get our seats back at deb's next sunday, heads will roll. prendas mashup t-shirts are available from the prendas website in sizes ranging from xs to xxl and at a cost of £19.95 each.